After leaving Venice with the cruise ship, we cruised through the night towards the south at full speed (we could always check the map and local info on the TV in our cabin). By the next day, after we had breakfast, the ship already reached the main port of Bari, where we took a “powerslide” 😛 and docked with the front facing out of the port. 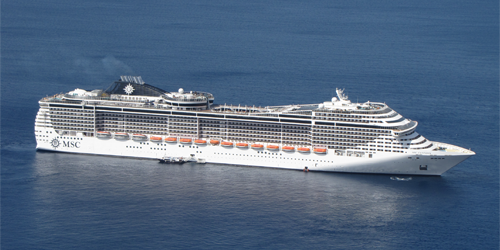 We were unsure if we really needed to book any excursion provided by the cruise while we were in Bari, since we were so close to the city center. We did not know exactly which way it was, but we knew we were close 🙂 . Anyway, we were informed, that there were buses standing in line to take anyone to and back from the city center at any time while we were docked in Bari for the humble amount of €8.50 (payable of course with our magic MSC Card). We decided to hop onto one of these buses and visit the city on our own. The bus ride itself took about 5-6 minutes and it left us right at the city center. From there we just had to try and figure out where to go. There were some tourist panels with a map, they just forgot the “You are here” sign from it… (well, we were in southern Italy, so that should not have come as a surprise 😛 ). After some careful examination of the streets around us and on the map, we were able to pinpoint our location and find our first destination: Via Venezia, a very nice pathway around the old city center with a picturesque view of the blue sea surrounding Bari. We followed the path for a while and then turned into the narrow, busy Italian streets to check out how the old city looks like. 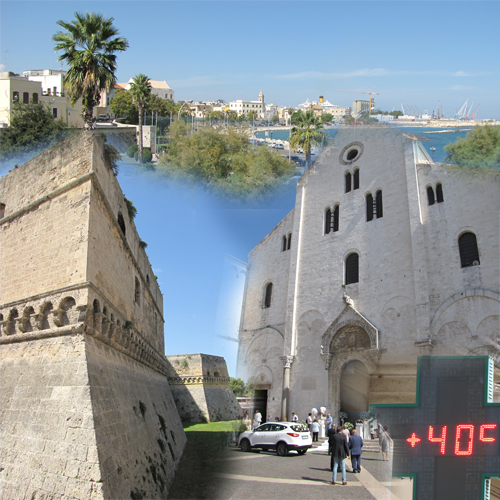 We basically admired the main cathedral, Basilica di San Nicola which offered us a bonus: a wedding ceremony was taking place just when we visited, so we could also have a look at how things like this are done in Bari 🙂 . After this we took a few wrong turns among the white houses until we managed to find our way out of the maze, just in front of Castello Normanno-Svevo, an imposing Norman castle built in the 12th century and acting as a nice tourist attraction today. We walked around it, took a few photos and decided we should grab something at the local “gelatteria”-s.
We sat down just across the entrance of the castle to a cosy restaurant, where we were served by a kind old man (probably the owner of the family-shop) with some of the most delicious gelato I ate in Italy. It was really refreshing, especially because according to the street thermometers there were around 40 °C in the sun. After cooling down, we slowly strolled back to the bus stop and went back to the ship. I have uploaded some photos here. 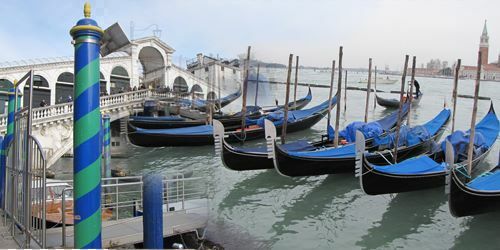 While in Venezia, we have dedicated half a day to visiting two islands near the main island: Murano and Burano. 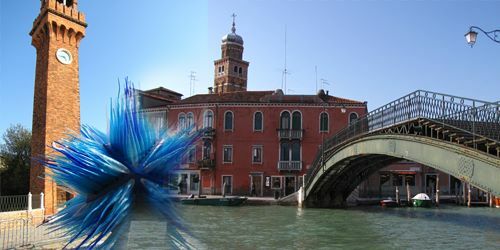 Murano is famous for its glass making industry. Basically the island is full of small workshops owned by different families specializing in artistic glass production. Getting to Murano is quite simple: ACTV, the local transportation agency, operates some ferry lines to the island (~10-15 minutes). We used number 12, which stops at the light-tower of Murano every 40 minutes. From there on one can follow the pathways among the channels, that split the island into smaller pieces (connected by bridges), where there is a line of shops with different glass-based decorative items. Some of them are funny, some of them just amazing and some about which I have no idea how on Earth they could make it. There is also a glass-museum in Murano, which is part of Musei Civici Venezia group (MUVE), hence our Museum Pass was valid and we could enter. One thing to note about the museum: although in some places it says that it is closed on Wednesday, we have actually payed a visit on Wednesday. Also on the official site it says nothing about being closed on Wednesday. Our route took from Murano to Burano, a smaller island to the north, about 20-25 minute boat ride from Murano (again, with route no. 12). 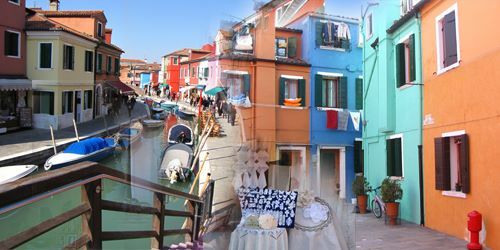 Burano is an interesting place to visit due to its colorful houses and it’s lace production. As in Murano, here too, there are a lot of shops, but instead of glasses, people are selling lace. The lace museum of Burano is also part of the MUVE group, so we have payed a visit. It is not a big museum, but it features a movie at the entrance which tells the story of lace production in Burano. Also on the second floor there was a group of women working with laces. I have no idea whether they were part of the “decorations” or just working there, but it was a good opportunity to have a look at how laces are made. Originally we planned to eat lunch at one of the islands, however, I think we would have received the same food for a bit more money as in Venezia. For that reason we decided to head back to the main island and continue our tour there. The islands conclude our two and a half day visit to Venezia, so my stories about the trip will end here. I think visiting Venezia is a once in a lifetime opportunity, so nobody should miss it out, if they have the chance to visit. Some pictures of the trip can be found here. So what else is important about Venezia, that should be written down? 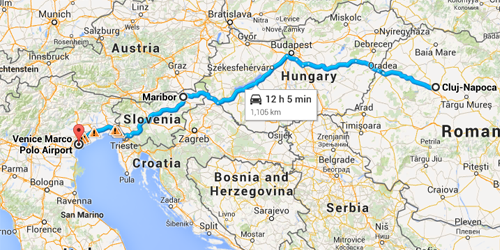 Well, one thing I had to take into account when planning the trip, was where, what and for how much can we eat? I have calculated with an average of €15 per person per meal (yes, it was a low-cost menu) and I must say, the estimation was not that far from reality. A meal in Venezia can range from the €4.50 Involitos (a type of sandwich) to €40 full course meals. It depends on what you desire and what are your standards. For us it was more like trying to get the taste of Italian food, and not to go and get fancy dining. There are tons of restaurants in the main island (and not only) so there is a quite big variety of places to choose from. At many locations a “kind” (bit pushy) gentleman invites (in all possible languages) the tourists passing by to have lunch or dinner, so I guess there is no way one can get out of the city without a stuffed stomach. It does not really matter whether you are in a central position or not, the prices are really similar at the Rialto Bridge, in a small alley near Piazza San Marco or the seaside. I have seen, however, that the prices are a bit higher on the islands, especially Burano. Of course if you do not want to taste Italian food, then there is the possibility to get to the only fast-food-restaurant chain that took hold on the main island: McDonald’s. They will surely offer the same food people all over the world are used to and at reasonable price. When you want to see so many places in such a short time period, you will surely not eat that much. For example on one of the days, our lunch was a simple Involito which we ate along the way between two museums. Speaking of museums, there is on more type of museum which is pretty popular in Venezia: entrance to some of the 17th century palaces among Canal Grande. Unfortunately they are closed on specific days of the week (each one on a different day) so plan your visit carefully. We only managed to visit Ca’ Rezzonico (which was closed on Tuesdays) but I guess most houses display the same values as this one. On several floors a typical rich Venetian palace is presented in Ca’ Rezzonico, the rooms ranging from large galleries to bedrooms. Also, from the upper floors of the house there is a beautiful view of the Grand Canal. Finally I have left one of the main attractions of Venezia: the Gondolas. As I have written in the previous post, there is quite a number of gondolas in the main island some quite nice, some a bit old looking and dusty. Make sure, however, that you do get on a gondola and not on a Sandolo which is a simpler version of it, but not the real deal 🙂 . A gondola ride usually cost €100 (for around half an hour), but one can negotiate the price to €80 (for which we got a ride of about 20-25 minutes). The gondolier we went with spoke fluent English and took us near historic buildings like the house where Casanova lived, a house where the German poet, Goethe lived and some other important buildings. 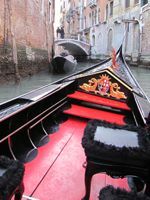 We mostly went along the narrow canals, where I must say I was amazed by the skills of the gondolier: you can bet on the fact that the gondola will not even touch another boat or any of the walls. Our gondola ride ended with a short trip among the Grand Canal after which we were taken back to the initial starting point. In my opinion it was one of the highlights of our stay, so if you’re in Venezia, you cannot skip this, even if it seems a bit pricy.